NEW DELHI & TOKYO, Oct 22, 2018 - (JCN Newswire) - With a demonstration project initiated in 2016, NEDO with its associate companies Hitachi, Ltd. and Hitachi India Pvt. Ltd. have introduced energy-saving solar power generation equipment and an information and communications technology (ICT) system at a hospital operated by the All India Institute of Medical Sciences (AIIMS), a premier public medical college and hospital located in New Delhi. The demonstration operation phase of the project has now started to verify the effectiveness of the ICT system that was introduced with the aim of improving the efficiency of medical care operations and optimizing energy management to reduce the hospital's power consumption by 30% compared to the levels FY2014, equivalent to 18,000 MWh or 16 crores INR per year. Expected investment for the project is approx.100 crores INR. In recent years, the population of India has increased to about 1.35 billion people, generating an urgent need to develop a social infrastructure corresponding with rapid economic development. India also faces challenging issues such as chronic power shortages and aging of its public facilities. In the medical field, Indian public healthcare providers are encountering a situation where they cannot always provide satisfactory medical services when compared to high-quality hospitals in the private sector. Under such circumstances, the Indian Ministry of Health and Family Welfare (MOHFW) announced a 'Clean and Green AIIMS' campaign in June 2014 and showed interest in projects to realize the campaign goal at AIIMS New Delhi. NEDO, MOHFW, and AIIMS New Delhi concluded a memorandum of understanding in November 2016 to carry out a demonstration project in which ICT would be utilized for integration of energy management and IT systems in the medical field. The goal of the project was to reduce overall hospital energy consumption and enable more effective management and processing of medical care data. For implementation of the demonstration project, NEDO selected Hitachi, Ltd. and Hitachi India Pvt. Ltd. as entrusted partners to introduce an energy management system (EMS), install new or upgraded highly-efficient utility facilities, including solar power generation equipment, and install an IT system which uses a high-efficiency storage server. The project is designed to demonstrate how ICT can reduce hospital energy consumption and improve the efficiency of medical care operations. The demonstration operations phase of the project has now started, which will evaluate how well the newly installed or upgraded equipment is operating, the level of energy savings being achieved, and how effectively the ICT system is managing and processing medical care data. The demonstration project is scheduled to be completed by the end of FY2019. In light of the results obtained during the project's demonstration operation phase, the hospital's energy management will be optimized with regard to its environmental, cost, and reliability-related aspects, with a goal of achieving a 30% reduction in the hospital's energy consumption compared to the FY2014 level. To commemorate the start of demonstration operation, AIIMS, NEDO, Hitachi, Ltd. and Hitachi India Pvt. Ltd. held a commencement ceremony on October 17 that was attended by Japanese and Indian government officials. 1. The project's goal is to optimize an AIIMS hospital's use of electricity and reduce its power consumption by 30% compared to the FY2014 level by reducing its consumption of commercial power and increasing its use of "green" renewable power sources through the introduction of new solar power generation equipment. The project also involves the installation of upgraded air conditioners, lighting, and IT equipment with high energy-saving performance features, and the installation of a new EMS. 2. 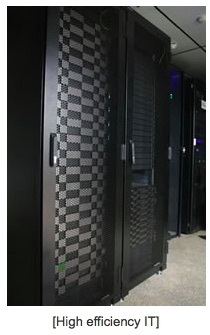 An ICT platform has been installed to provide the IT infrastructure needed to not only control energy use but also assist in optimization of energy management and improvement of operational efficiency by better managing and processing medical data and verifying the effectiveness of the system. In future, increases in the hospital's energy consumption will be restrained given the energy savings realized through optimization of utility facility and medical care operations. The optimum operation of utility facilities can be realized by forecasting energy demand based on facility and weather conditions. Optimization of medical care operations can be realized by improved integration of medical data using high-efficiency IT solutions. Since the development of social infrastructure is a responsibility of the Indian government, MOHFW has made the clean and green transformation of AIIMS one of its top priorities. AIIMS New Delhi is the first medical institution in India to excel in promoting energy conservation and efficiency. Entrusted parties: Hitachi, Ltd. and Hitachi India Pvt. Ltd.
An ICT platform is a type of infrastructure for energy operations that integrates energy-saving equipment and IT devices. In addition to controlling energy use, it can manage and process data in a comprehensive way, thereby optimizing energy management and improving the efficiency of medical care operations. The New Energy and Industrial Technology Development Organization (NEDO) is a national research and development agency under the Ministry of Economy, Trade and Industry, the Government of Japan. Following the two oil crises of the 1970s, NEDO was established in 1980 to promote the development of oil-alternative energy technologies. NEDO is active in a wide variety of areas as one of the largest public research and development management organizations in Japan.